a.Ride Open Trails: Respect trail and road closures — ask a land manager for clarification if you are uncertain about the status of a trail. Do not trespass on private land. Obtain permits or other authorization as required. 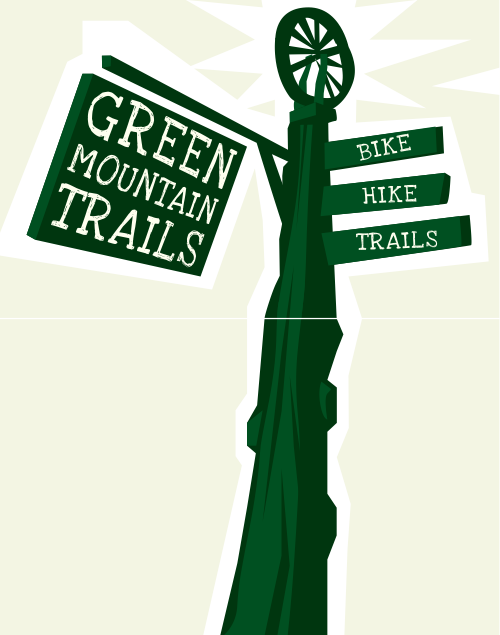 Be aware that bicycles are not permitted in areas protected as state or federal Wilderness. b.Leave No Trace: Be sensitive to the dirt beneath you. Wet and muddy trails are more vulnerable to damage than dry ones. When the trail is soft, consider other riding options. This also means staying on existing trails and not creating new ones. Don't cut switchbacks. Be sure to pack out at least as much as you pack in. c.Control Your Bicycle: Inattention for even a moment could put yourself and others at risk. Obey all bicycle speed regulations and recommendations, and ride within your limits. d.Yield Appropriately: Do your utmost to let your fellow trail users know you're coming — a friendly greeting or bell ring are good methods. Try to anticipate other trail users as you ride around corners. Bicyclists should yield to other non-motorized trail users,unless the trail is clearly signed for bike-only travel. Bicyclists traveling downhill should yield to ones headed uphill, unless the trail is clearly signed for one-way or downhill-only traffic. In general, strive to make each pass a safe and courteous one. e. Never Scare Animals: Animals are easily startled by an unannounced approach, a sudden movement or a loud noise. Give animals enough room and time to adjust to you. When passing horses, use special care and follow directions from the horseback riders (ask if uncertain). Running cattle and disturbing wildlife are serious offenses. f. Plan Ahead: Know your equipment, your ability and the area in which you are riding and prepare accordingly. Strive to be self-sufficient: keep your equipment in good repair and carry necessary supplies for changes in weather or other conditions. Always wear a helmet and appropriate safety gear. 2) Be aware of the trail conditions posted on our website or at the trailhead and heed all closings. 3) At the request of the landowner, dogs are not permitted. 4) Hunting is allowed on portions of the trail system in season. Be aware of the dates and wear bright clothing. Weapons are prohibited at all other times. 5) We allow camping with permission. Email us for details. 6) Park only in designated areas. Parking along route 100 is strictly prohibited. Violators will be towed at their own expense. 7) For your own safety, please sign the registry at the trailhead. 8) We highly recommend that you use the trails with at least one or preferably two other people. Keep in mind that cell phone service on the trails is very unreliable, if not impossible. 9) Motorized vehicles, including e-bikes, are prohibited on the singletrack and, elsewhere on the system, limited to those who have received permission.